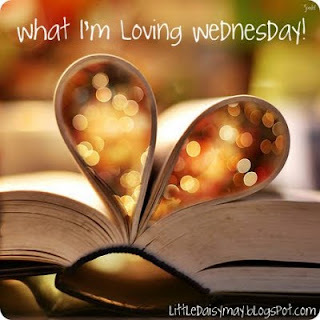 Hand In Hand: What I'm Loving Wednesday! Cough drops. I'm fighting off a major sore throat and these have been a life saver. My baby girl! She's been kicking a lot lately. She's measuring about 10 1/2 inches (like a carrot) and I'm 21 weeks along now. Crazy! Michael and Jexi, of course! Pure Chocolate's from The Coffee Bean. They are soooo delicious and refreshing! My pedicure. I can't bend over to paint my toes anymore. I love getting the white tips. I feel so feminine with pretty nails! The baby bedding I have picked out right now. I found it at Target and I think it's super cute. I want to paint the room a matching light green and maybe have pink wall art. This is my first time linking up for WILW! Love that bedding - so cute! Seems like the cold that's making it's rounds is sticking around for quite a while...hope you get to feeling better! You are loving some amazing things today! Hope you have had a great Wednesday! Cough drops have been a friend around here lately as well. The pollen is insane! I adore that bedding! Soooo cute!! I am the WORST at having a sore throat, b/c I hate cough drops! lol. But my hubby is the same way -- he lives on them when he needs to! Very cute bedding! Are yall also going with a white crib/furniture? Are you buying the bedding, or seeing if yall get it as a shower gift? 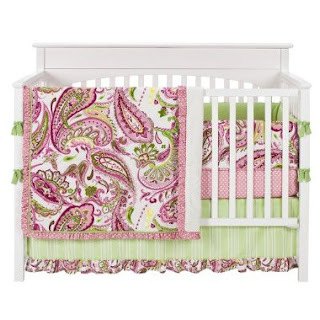 I love that bedding and think it'll go wonderfully with light green walls. Great design! I love the bedding too! Oooooooooo I lOVE that bedding!!! So presh!! Love that bedding. It is precious. My son's room was a sage green when he was a baby. It would go great with that bedding. that's so fantastic congratulations on the baby! and marriage of course, lol. that's such a beautiful thing.. Hope your feeling better from the sore throat.. I love that bedding you picked out!! So cute!